Weighty Matters: Milk prevents colon cancer? We physicians get a great many free publications. One that comes regularly is a trade journal called The Medical Post, and in it the Dairy Farmers of Canada are regular advertisers making half page buys geared to look like articles that they entitle Nutrition and the Physician. These pieces in turn are generally written or at the very least attributed to physicians, professors and dietitians highlighting some benefit of dairy consumption. For a long while the bulk of these medical advertisements were about milk's role in weight management but that died off shortly after Big Milk in the US agreed with the Federal Trade Commission that claims regarding milk and weight loss/management were preliminary at best. The most recent version I read was about milk products and the prevention of colon cancer and it is attributed to Dr. Parviz Ghadirian, the Director of the Epidemiological Research Unit at the Hotel-Dieu hospital in Montreal and a Professor in the Department of Nutrition at the University of Montreal. 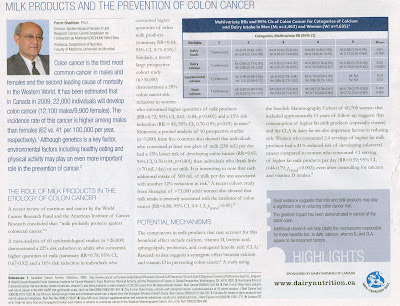 The advertisement rightly points out that there is indeed some evidence to suggest a modest risk reduction for colorectal cancer with the consumption of diets high in dairy. "The strongest evidence, corresponding to judgements of ‘convincing’ and ‘probable’, shows that milk probably protects against colorectal cancer, and that diets high in calcium are a probable cause of prostate cancer"
Funny the advertisement doesn't mention anything about prostate cancer risk and hmm, isn't milk high in calcium? "Interestingly, both dietary and supplemental sources of calcium showed inverse effects, with the latter reducing colorectal cancer risk by 24%"
Strange how Dr. Ghadirian's advertisement doesn't mention that fact. "dairy food intake was inversely associated with cancers of the head and neck, esophagus, stomach, colorectum, and bladder, whereas it was positively associated with prostate cancer"
"Total calcium intake was significantly related to a lower risk of colorectal cancer and showed a weak inverse association with kidney cancer. On the other hand, total calcium intake was not related to prostate cancer." "Cheese intake was weakly positively associated and yogurt intake was weakly inversely associated with colorectal cancer risk". What's that, cheese might increase colon cancer risk? Let's take a look at the World Cancer Research Fund's report on cheese - did they find it might increase colon cancer risk? Yup. "There is limited evidence suggesting that cheese is a cause of colorectal cancer." Hey, isn't cheese a milk product? "A study using the Swedish Mammography Cohort of 60,708 women that included approximately 15 years of follow-up suggests that consumption of higher fat milk products (especially cheese) and the CLA in dairy fat are also important in reducing risk." Pulling the Swedish study one learns that the researchers weren't clear on why their results on cheese differed from everyone else's and they hypothesized that it might have to do with the fact that their cohort ate a tremendous amount of cheese and admit that the differences in their diets don't stop there leading me to wonder if perhaps they're not the greatest population upon which to draw global, or at least North American, conclusions. So to summarize Dr. Ghadirian's milk sponsored medical advertisement: Milk products, especially cheese, reduce the risk of colon cancer. To summarize the actual medical literature used by Dr. Ghadirian: Milk products decrease the risk of colon cancer to a degree pretty much identical to that seen with calcium supplementation but at the same time in men increases their relative risk of prostate cancer, while diets high in cheese potentially increase colon cancer risk except in Sweden. My advice to my dear readers? If you read anything sponsored by the Dairy Farmers of Canada you'll probably want to read the studies themselves before drawing any conclusions, and if Big Milk comes a' knockin' on your door asking you to write one of their medical advertisements tell them, "no thank you" and while you might lose a few bucks of chump change (literally perhaps), at least you'll keep your ethics. And here I'm really at a loss. Dr. Ghadirian is a world class researcher and epidemiologist. How is it that he agreed to put his name on an advertisment that omits such highly pertinent data?